I love the military, those who serve and those who have served. We live where we do because my husband was in the military. When he served on a submarine deployed out of Scotland he would look at the guys standing on the shore waving them out on patrols. He made a promise to himself that someday he would be the guy on the shore looking out at the submarine and waving them on their way. 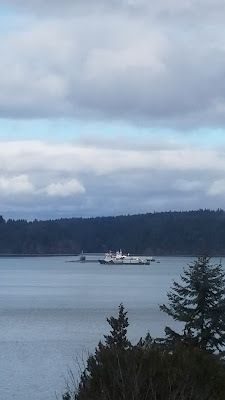 I love seeing the submarines go by and the Coast Guard as they both run drills in front of our home. I wave even if no one is topside just encase one of those guys are hoping to be us someday. We over the years have lived in many military communities and loved every one. We have been fortunate to counsel at a Young Life outreach camp for military from the surrounding bases. It is a wonderful camp where Dads and Moms get to reconnect with their kids up in the Canadian woods and start to heal as a family. My wish for everyone would be that you could spend some time talking with someone in the military, hear their stories and realize what a cost your freedom is daily. I am so thankful for all who serve or have served. I cry during the national anthem and any time I hear colors or taps. I love my flag and all it stands for. I was so happy to find a wonderful service in town set up by our Boy Scouts. 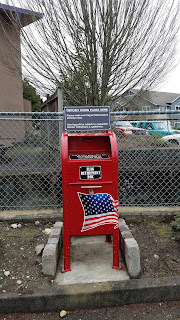 It is a red box which looks like your ordinary mail box but it is to dispose of your flags properly. You just fold your worn flag or one you need to dispose of and put it in. The Boy Scouts will take care of retiring it with the proper honor. 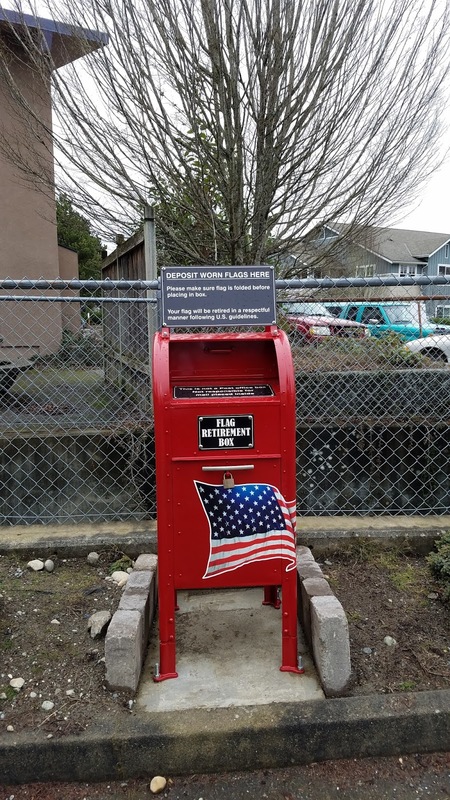 Look around your community and see if you have one too. Take time out of your day and look up how to honor your flag. And most of all if you see a service man or woman or a veteran, stop and thank them for their service.